Tonight's Perfect Circle event at the 40 Watt will benefit Community Connection of Northeast Georgia and Family Connection/Communities in Schools. Don Chambers + GOAT, Liz Durrett, Iron Hero, Nate Nelson, Heavy Feather, Packway Handle Band and Spring Tigers will play songs from R.E.M. 's historic 1983 debut LP to mark the 25th anniversary of its release. A deluxe edition of the album will be available for sale, but R.E.M. will not be performing or attending tonight. The doors open at 8 p.m. Tickets are $10 in advance. is for the frequent traveler who makes it a point to attend sporting events when on the road, and has a penchant for local cuisine. We tap some of the premiere locally-based sports bloggers on the web to offer their culinary tips and suggestions when rooting for the home team. So feel free to visit the site, especially the Athens article and offer any suggestions you might have to the comments! I will make sure I add them to the Google map included with the article. A Rose Of Athens Theatre holiday tradition, this is the tale of an enduring friendship between a small boy (Buddy) and his eccentric cousin (Sook). Truman Capote's true story of the happiest time of his childhood is performed with live piano accompaniment composed by Bart King, exclusively for this reader’s theatre style production. This theatrical staged reading with music is sponsored in part by the Athens Downtown Development Authority and will feature the performances of Lisa Mende, Bart King, Ben Reed, Kathleen Hogan, Lisa Cesnik, Vicky Moody, Tim Harris, Norman Ferguson and more. Truman Capote’s holiday stories are adapted by Russell Vandenbroucke and directed by Joelle Re Arp Dunham. Holiday Memories is a play with music that encompasses two Capote short stories: A Thanksgiving Visitor and A Christmas Memory. It is wonderfully Southern and a perfect way to enjoy, embrace and celebrate the holidays with family and friends. The heartwarming holiday music, composed and performed by Bart King on piano, both underscores the reading and adds beautiful color to this already delightful play. New to Rose of Athens Theatre, Tim Harris, who plays the part of the narrator (Truman), is very familiar with this classic Southern story. He performed it at a live radio show at NPR for the 2001 Peabody Awards. His love of the narrative propels him to play the NPR live show every year for his Buford High School students. Donations of canned food are welcome at each performance. This play is recommended for ages 8 and older, all ages can enjoy it. Tickets:. December 5th , @ Oconee Presbyterian Church “Pay What You Will”. December 6th @ Cine’ - $10 adults and students, $5 for children. moonshine arts magazine ( http://www.moonshine.southerncreativity.com ) is seeking creative writing pieces, artist interviews, writings from the studio by artists, music and literature reviews, as well as other art related topics. Writers for moonshine are a diverse bunch from across the southeast (including some local Athenians). We are graphic artists, music appreciators, painters, poets, photographers, filmmakers, journalists, novelists, essayists, librarians, geeks, art professors and every other label imaginable. We seek authentic and interesting Southern voices to contribute creative writing pieces or writings about the artistic experience -- "from the studio". We are also seeking writers to write about art -- any genre AND medium of art (music, performance, visual arts, etc. ), as well as any time period (contemporary to 16th century to everything in between). We also sponsor a regional arts list hosted @ blogger -- drop me a line if you are interested in contributing. Athens Holiday shoppers can find unique, handmade gifts and stocking stuffers at the 3rd Annual Athens Indie Craftstravaganzaa: Holiday Market - November 22. This handmade market of artists and crafters has brought together over 50 vendors from around the Southeast. From fine arts to fashion, you'll find an emphasis on recycled materials, local and green production methods, and often an edge to the work that sets it apart from what's at the traditional county fair. There's a variety of wares in a range of prices, so you can enjoy the hassle-free holiday shopping with the satisfaction of knowing that your gifts will be truly unique. New this year is a Kids Craft area, where we've provided crafting supplies for the little ones to make an ornament that's theirs to keep. Come share some creative time with your kids from noon until 4pm. We are also hosting a silent auction of donated artwork, items, and services to benefit the liver transplant fund of 12 year old Olivia Grace. Athen's own DJ KurtWood provides the soundtrack for the day, spinning his renowned collection of 50s and 60s Soul, R&B and Garage 45s. Come and see us on November 22, 10am until 6 pm. Corner of Pulaski and Clayton Streets, Athens, GA. The downturn or recession or worse that is our lot these days might be a flu that already is taking the lives of some of the older of our town's businesses. Foster's Jewelers is closing after half a century, and the paper reports this morning that the Ryan's Steakhouse on our side of town already is closed after a 29-year run. As strangers can become acquaintances and then friends and then dear friends, so it can be, for me at least, with businesses. When a business I've come to know well over many years closes, it's not unlike a dear friend leaving town. When I pass the place that was Barnett's when I arrived in Athens forty years ago as a freshman, and was Barnett's still until earlier this year, I can see the Banner-Herald and the Daily News and the Journal and the Constitution and the Times stacked below the storefront window, and smell the newsprint and the tobacco and the oldness of the place, and I feel a bit of guilty nostalgia for the forbidden magazines, sirens calling to freshmen from the back corner on the right. Charmar, the mini-nursery and flower shop and gift shop and neighborhood post office on Gaines School Road, was as dear to Pat as Barnett's was to me, and it closed this year, too, a victim not of the economy, but of the drought and the attendant watering ban. Foster's Jewelers was never a close friend of mine, as it must have been for some of you. Occasionally, I made my way past the antiseptic glitter of the jewelry cases, feeling almost that I had entered a foreign country without a visa, to reach the watch repairer at the back. It never occurred to me -- although it should have, being the way of the capitalist world -- that the granite-solid "Foster's corner" downtown ever would be anything other than Foster's. Foster's Jewelers, located at Clayton and Jackson streets for over 50 years, is going out of business. Prices will be reduced up to 70% off. The store scheduled private previews of its inventory last week and publicly announced its closing last Friday. We are working on our float to be in this year's Parade of Lights on December 4, 2008. Our theme is "The Purr-fect Gift is Love". This is a great outreach to the community. Please email me if you are able to donate any of the the above mentioned items. All Christmas lights may be brought to the any of our three locations. Be sure to label with your name if you would like them returned to you. Items are needed by November 22nd! Sunday marks the inaugural show of Visionary Growth Art Center and we have some incredibly talented artists from a wide range of backgrounds and ages. This exhibit features visionary artists with disabilities Annie Wellborn and Carter Wellborn in addition to Heather Cosgrave, Michael Davenport, Stephanie Grafton, Jonathan Jacquet, Barren McFarlin, Richard McLamore, and Hannah Shoemaker. The reception with the artists is the afternoon of Sunday, Nov. 23rd, 2-5pm and this email is your invitation! All are welcome! View the invitation below or here. We are about 20 minutes outside of Athens. Directions are here or call 706-248-9599. If you have been to Lowery Gallery before, that's where to go! Please feel free to forward this invitation to anyone who might like to come. About Visionary Growth: Located just outside Athens, Georgia, Visionary Growth is a studio, gallery and farm serving visionary artists with developmental, mental and physical disabilities with artistic instruction, gallery promotion, self expression, and therapeutic gardening / farming. Back from a China tour, the UGA Jazz Ensemble will be playing for the home folks tonight (Tuesday, November 18) at 8 p.m. in Ramsey Hall on the East Campus. Pat and I will be there, and Ian, too, if we can drag him away from his Xbox. If you've never heard this first-rate ensemble, headlined by Steve Dancz on the piano, swing on by tonight. It's free. You can wear jeans and a hoodie. Hey, if you're just going sit at home and watch TV instead, you're not taking advantage of one of the true perks of living in our town. -- Bob Brussack. So I finally became a lawyer two weeks ago, and I'm planning my own practice now. I need to find an office to rent in a few months, and I'll need to fill it with some used furniture. E-mail me if you know anyone trying to get rid of desks, credenzas, bookshelves, and stuff like that. There is a lot of vacant office space, but please also let me know about good deals, especially shared space with other professionals. I am going to start working from home, but hopefully this will be just a temporary arrangement. You may have seen my earlier post about my search for a mentor. I was very fortunate to find a volunteer just last week, but there are other new lawyers in need of mentors this month, so I will leave the message posted. Early voting for the Dec. 2 runoff election starts today at 2 p.m. at the Board of Elections office at 155 East Washington Street, and it runs 8 a.m. to 5 p.m. through Nov. 26, not including weekends. There is a sample ballot and a voter information guide available online from Athens-Clarke County. It's a mystery to me why anyone would open an account at a place like Bank of America and pay for all their crazy fees. Credit unions have multiple branches, and their share their ATMs with members of other credit unions for no fees. Joining a credit union is the best banking decision you'll ever make. I have been alerted to a delivery service called ClunchTime serving central and south campuses at the University of Georgia. If you place an order two hours in advance, you can order food from Barberitos or Which Wich and have it delivered to the Student Learning Castle or the Science Library. There is a delivery charge, but a free beverage is included. Customers can select among a number of delivery times between lunchtime and later into the evening. Business student Michael Peloquin launched the business this semester and has plans for expansion and heavier promotion next semester. The service will include more restaurants and reduce the lead time for placing orders. Peloquin explains that a different sort of delivery service is needed for people who need to stay on campus but can plan ahead for lunch, so ClunchTime can fill that need. 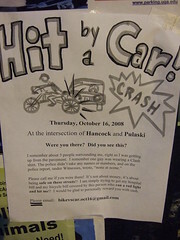 This flier announces the search for the witnesses who saw a car hit a bicyclist at Hancock Avenue and Pulaski Street on Oct. 16. Residents of Athens-Clarke County have reported receiving phone calls from a person identifying themselves as law enforcement. The residents are told that the officer is investigating money laundering and that they hold a warrant for the residents arrest. The caller will not identify the agency that they are with or the agency that holds the warrant. They also refuse to communicate with the resident's attorney. Eventually the caller attempts to get the resident to confirm their current address , social security number and other identifying information. This is a scam to steal or confirm stolen identity information. The calls are coming from a number off of a company that provides voice over internet (phone calls over the internet). Thus the number appears to come out of California, but they can be calling from anywhere in the world. The Athens-Clarke County Police Department reminds you that if the caller is legitimate they can provide you with the agency they are calling from and a publically published phone number that you can confirm and call back. NEVER provide identity information or confirm identity information over the phone or internet unless you are sure of the person 's identity with whom you are talking to. Upcoming events -- film, music, dance, etc - many free! The annual Freedom Breakfast honoring the Rev. Dr. Martin Luther King, Jr. will be held Friday, January 16, 2009 at the Georgia Center. Nominations are now being taken for the Fulfilling the Dream Awards ... nomination information and guidelines may be obtained by emailing diverse@uga.edu. Deadline for nominations is November 20. November 14 Film Shorts Screening. Sponsored by Invisible Children. Representatives from the Invisible Children International Body will be present to further discuss the issues people in northern Uganda are facing and address how students can get involved in ending the longest running war in Africa. 4:00 P.M. and 7:00 P.M. Cine. Contact: caitlinn@uga.edu. November 14 Coffee Hour. Sponsored by the International Student Life Office. Experience new cultures and meet new people while sampling food from around the world. This week's Coffee Hour is co-hosted by ASHA for Education and the UGA Office of International Education in celebration of Children's day in India. Awards will be presented for OIE's 2008 International Photo Competition. Come between 11:30 A.M. and 12:30 P.M. to view all this year's photo submissions and cast your vote for the People's Choice Award. Winners for all categories will be announced at 12:45 P.M.11:30 A.M. - 1:30 P.M. Memorial Hall Ballroom. Contact: 706-542-5867. November 14 IWS Friday Speaker Series. Sponsored by the Institute for Women's Studies. Nik Heynen, associate professor of geography, discusses Agitating Political Ecology in the Apps: Anarcho-Feminist Traditions for thinking about Squashing Spatial Hierarchies in the Southern Appalachian Mountains. 12:20 P.M. - 1:10 P.M. Miller Learning Center Room 250. Contact: momolly@uga.edu. November 14 Ballet Flamenco José Porcel. Sponsored by The UGA Performing Arts Center. Flamenco dance troupe. $24/$29, half price for UGA students with valid ID. There are discounts for groups. 8:00 P.M. Hodgson Concert Hall. Contact: 706-542-4400, www.uga.edu/pac. November 14 Dance Performance. Sponsored by Bethlehem Ministry. The event supports a new medical clinic in Terrier Rouge, Haiti.. Music by Moyuba! drum ensemble and One L., an Afro-Cuban inspired band. Speakers will begin the program, followed by Moyuba! drum ensemble and dance performances by Danbala Afro-Haitian dance ensemble and Shakti Project. The evening will end with music from One L. Some snacks will be provided. Please come and enjoy a great evening of folk music/dance from Haiti/Cuba and to meet other members of our community who are commited to fullfilling the dream of healthy, sustainable living in Terrier Rouge. Donation is $5-$10. 8:30 P.M. Little Kings. Contact: Tara Faragoza at 706 614 6331, tarafara37@hotmail.com, www.BethlehemMinstry.org. November 15 5th Annual Night In Saigon. Sponsored by the Vietnamese Students Association. A showcase of the beautiful Vietnamese culture with a fusion of traditional and modern highlights of Vietnamese life. There will be entertaining show featuring a diverse variety of performers including dancers, singers, skit actors, and tons of delicious food. For natives and those wishing to introduce themselves to the culture. Tickets $9 at the door or by phone at 706-542-8074. 7:00 P.M. – 10:00 P.M. Oconee County Civic Center, Watkinsville. Contact: vsa@uga.edu. November 16 Concert Bella Italia. Sponsored by the Hugh Hodgson School of Music. The fall concert by Collegium Musicum, an early music vocal ensemble, features early vocal and instrumental music from Italy. 6:00 P.M. Emmanuel Episcopal Church, 598 Prince Avenue. Contact: 706-542-3737, www.music.uga.edu. November 16 Weaving the Threads of Justice. Sponsored by Russell Library and Partners. An afternoon of film, lecture, & music. The program features a screening of the documentary film, The Telling Takes Me Home, a commentary from Guy, Candie, and Heather Carawan and performance with Professor Art Rosenbaum. Guy, a folk musician and the center’s music director in the late 1950s and early 1960s, introduced, “We Shall Overcome” during a training camp for SNCC workers in 1960, after which it quickly emerged as the anthem of the Civil Rights Movement. Reception and gallery tours after the program. 2:00 P.M.
Russell Library, Main Library. Contact: 706-542-5788, www.libs.uga.edu/russell. November 17 Thanksgiving Feast. Sponsored by International Student Life. A traditional American Thanksgiving feast will be provided for international students and their families. Reservations required. 6:30 P.M. Contact: 706-542-5867, ugaisl@uga.edu. November 19 Safe Space Training. Sponsored by the LGBT Resource Center and the Lambda Alliance. An orientation to raise awareness and knowledge of lesbian, gay, bisexual, transgender issues and to suggest ways to serve as an ally to LGBT individuals. Following the orientation, participants receive a Safe Space decal. To register, visit www.uga.edu/safespace 8:30 A.M. - 1:00 P.M. Contact: 706-542-4160, jmiracle@uga.edu. November 19 World Fest. Sponsored by the World Ambassadors. Various student organizations will join together to feature displays and performances in a universal cultural celebration. 10:00 A.M. - 2:00 P.M. Tate Student Center Plaza. Contact: 706-542-5867, edarren1@uga.edu. November 19 Fall Teaching Academy Workshop. Sponsored by the Office of Institutional Diversity and the Teaching Academy. Observations and the recommendations from the Workshop, titled A Conversation on UGA's Cultural Climate, will be forwarded to the University's Diversity Advisory Committee and the Office of Institutional Diversity. The workshop is open to Teaching Academy members, UGA faculty, and students. Please RSVP. 3:30 P.M. CAES Student Activities Center, Four Towers Building. Contact: shilley@uga.edu. November 19 Lecture. Sponsored by Institute of Native American Studies. Speaker Dr. Roger Maaka, professor of indigenous studies at the University of Saskatchewan, is a Maori scholar and a figure in both Native American and Indigenous Studies internationally. 4:00 P.M. Miller Learning Center Room 248. Contact: 706-542-3716, jweaver@uga.edu. November 20 International Education Week Reception. Sponsored by International Student Life. Desserts and refreshments will be available to celebrate International Education Week, a nationally recognized week started by the Department of State and Department of Education. 5:00 P.M. - 6:30 P.M. Memorial Hall Ballroom. Contact: 706)542-5867, ugaisl@uga.edu. November 21 Coffee Hour. Sponsored by the International Student Life Office. Experience new cultures and meet new people while sampling food from around the world. 11:30 A.M. - 1:30 P.M. Memorial Hall Ballroom. Contact: 706-542-5867. November 21 IWS Friday Speaker Series. Sponsored by the Institute for Women's Studies. Amanda Gailey, assistant professor of English, discusses Representations of Race and Gender in Children’s Literature of the Gilded Age. 12:20 P.M. - 1:10 P.M. Miller Learning Center Room 250. Contact: momolly@uga.edu. November 21 Conversation Hour. Sponsored by Research & Engagement in Diversity (RED) on Teaching Diversity. Also, not yet posted to AthensTheatre, there are auditions for the UGA Baptist Collegiate Ministries production of Seussical the Musical through the 14th (by appointment). The show will run in February. Check out the UGA BCM Drama page for more info. Finally, Canopy Studio will have a fundraiser performance at 7 30pm and 9pm on November 21st. Admission is $5 and the details will be posted to AthensTheatre.com within the next week. The Bloodsugars are performing tomorrow night, Nov. 13, at Tasty World. Their label, Engine Room Recordings, describes them as "indie dance rockers" set apart by their "intelligent songwriting and arrangements." My perusal of their MySpace playlist does reveal some very engaging melodies and a lot of creativity. While you can count on brisk tempos throughout their music, the songs have different moods and varied instrumentation. The Bloodsugars are also touring with The Lisps, a band with some more folksy and acoustic sounds. Local band Part Bear is also playing, and considering their rock style is a little harder, this will be quite a balanced and enjoyable show. *The event will be held Friday Nov. 14 @ Little Kings and begins at 8:30pm. Donation is $5-$10 (or more if you like!) at the door. *Dance performances by Danbala Afro-Haitian dance ensemble and Shakti Project. Music by Moyuba! drum ensemble and One L., an Afro-Cuban inspired band. Speakers will begin the program, followed by Moyuba and dance performances, the evening will end with music from One L. Some snacks will be provided as well! The event supports a NEW medical clinic, Clinique Esperance et Vie, in Terrier Rouge, Haiti. Money will go to Bethlehem Ministry, an organization dedicated to improving education, health and environment in Terrier Rouge. Visit www.BethlehemMinstry.org for more details. Also visit www.peopleandplace.org to see some cool environmental changes happening in Terrier Rouge. Please come and enjoy a great evening of folk music/dance from Haiti/Cuba and to meet other members of our community who are commited to fullfilling the dream of healthy, sustainable living in Terrier Rouge, Haiti. Please pass along this email this to your friends! Gov. Sonny Purdue signed a bill (HB670) which allows a 35% State tax credit for Georgia Residents who install solar on their homes. With the 30% Federal tax credit already in place, a total of 65% of the cost of installing a solar system is covered. This makes solar quite appealing for homeowners. There are two types of solar available in the market today. One is Photovoltaic, or PV. PV solar panels generate electricity for your home with light from the sun. The other product is solar thermal. Solar thermal panels heat water the same as your existing water heater for domestic and space heating uses. Both qualify for the State and Federal tax credits. Solar thermal is an affordable way to start saving money using the sun. Georgia has an ideal climate for solar systems with an abundance of sunlight to naturally heat water for your home. “On average, if you install a solar water heater, your water heating bills should drop 50% - 80%. Also, because the sun is free, you’re protected from future fuel shortages and price hikes,” says the U.S. Dept. Of Energy EERE Consumer’s Guide. A typical four-person household with two teens uses a lot of hot water. For this household, a system with 60 square feet of solar collectors and an 80-gallon solar heat exchange tank would be used. The average installed cost for this system is $6,520. After tax credits this system's cost would be $2,967. This household should see savings on their water heating cost averaged over the year of $20 per month. A solar thermal water heating system works. We get plenty of sun here in Georgia, so why pay for hot water if you don’t have to? My solar thermal customers have been noticing an immediate savings on their energy bills. I work closely with Power Partners Solar, a local manufacturer of solar thermal water heating systems, to sell, install and service their product. I have also developed a class for do-it-yourselfers and professionals to learn how to install these systems. The U.S. Dept of Energy website www.doe.gov has a lot of in depth information available (see this page for solar thermal data), and www.dsireusa.org can tell you more about the State and Federal tax credits. Tony Purcell is a green builder and the owner of Complete Resources Building & Repair, Inc. I do not often talk or write about politics. Part of the reason is because it can be and has been a most divisive issue. But today is different. For the first time in my adult life I am concerned and scared about what the future will bring for this country. Not for myself, but for the two most precious gifts in my life, my daughters. Never in my voting history have I ever voted for a Democrat I would rather have walked across hot burning coals or chewed glass than vote for John Kerry or Bill Clinton. As trivial as it may seem to some, I could never bring myself to vote for a man, John Kerry, who threw his medals away. To me, this was not only disrespectful to his country, but to his fellow soldiers and sailors who sacrificed much more than he did. I voted for Reagan and Perot. I voted for Dole. I voted for Bush Senior. I voted for W in 2000, and again in 2004. The remorse I have felt ever since my 2004 vote only deepened as I watched my retirement savings disappear in this financial crisis we are in. I cringed as we had to cut back on normal things we did with and for our children a gasoline spiked over $4 a gallon. Granted, all problems a country faces cannot be tied to a single presidency. And the current financial crisis is as much the fault of Clinton and the Democrats as it is of Bush and the Republicans. After the primary season and the conventions, I was really open to either candidate. I have much respect for John McCain, the sacrifices he has made for the country, and the years he has given to public service. But watching Sarah Palin over these past few months, I could not ignore the fact that she would be one heartbeat away from the Presidency. To me, her far-right evangelical views are as much a problem for me as a voter as are the far-left liberals. The anger, hatred, vitriol that was coming out of her mouth made me feel sorry for her and McCain, sorry that they had to stoop to that level. The very fact that McCain could not control her or the message being put out by the Republican Party (and his campaign) was very much a concern for me. There is fear, uncertainty and doubt (FUD) in every campaign, and how I hate FUD. There was enough being spread by both parties that the grass should be growing in the fields for years to come. In the Georgia Senate race, Democrat Jim Martin is running ads saying that Saxby Chambliss wants to implement a 23% federal sales tax. No, Chambliss is supporting the "Fair Tax", a plan that would eliminate the federal income tax and the IRS. This is a plan worth at least examining and debating. Chambliss attacked Martin for being fired from his job by the Governor and voting to raise his expense account as a member of of the Georgia General Assembly by 27%. 27%??!!! Wow. The reality is was that the General assembly has not increased the per diem in over 10 years at that point. All of the accusations against Obama have been troubling to say the least. "He is a Muslim. ", cried republican supporters. In the words of General Colin Powell, "So what if he is?". I am in no way a fan of Barrack Obama's views on abortion and his stated desire to pass a "Freedom of Choice" bill. The thought of the Democrats having control of the House and Senate, with hypocrite Nancy Pelosi as Speaker of the House, is truly frightening. The though that Democrats might try and bring "imputed income" into the calculation of federal Income taxes, as they tried in the early 1990's, gives me pause for concern. But W has done more to destroy the fabric of this country over the past eight years than anyone could imagine. A woman who thinks she has foreign policy experience because Alaska is next to Russia and Canada is naive at best, ignorant at worst. The thought of putting her into a position to be a post-McCain leader of the Republican Party and possibly president is, to me, unconscionable at best. Four years ago, when friend and colleague Richard Schwartz said that Obama could very well be a presidential candidate, I scoffed at the notion. In the end though, I had to vote with my head and my heart. 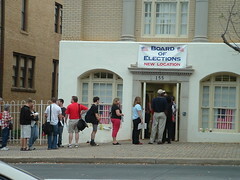 On October 20, 2008, I went to the Athens-Clarke County Board of Elections and voted. I Voted for Obama. I voted for Jim Martin for the Senate. I voted for Bobby Saxon over incumbent evangelical Christian Paul Broun for Congress. I voted for openness to discussion and against the hatred and closed mindedness of the Georgia delegation to Congress. Hell surely must hath frozen over! Either that or I am a traitor and a Muslim sympathizer. Sorry, not even close. "There were two things that struck me during the game. First, Mark Richt must have had the biggest brain spasm to call for that on-side kick after scoring their first (and only) field goal... Then there is Urban Meyer calling those timeouts in the last minute of the game...What Meyer did on Saturday was a cold, deliberate action. It was not about celebrating the joy of something positive. It was about rubbing an already painful loss further into the faces of the Georgia players, coaches and fans...It was just poor sportsmanship." Here are some scenes from the Democratic Rally on Thursday at The Varsity.